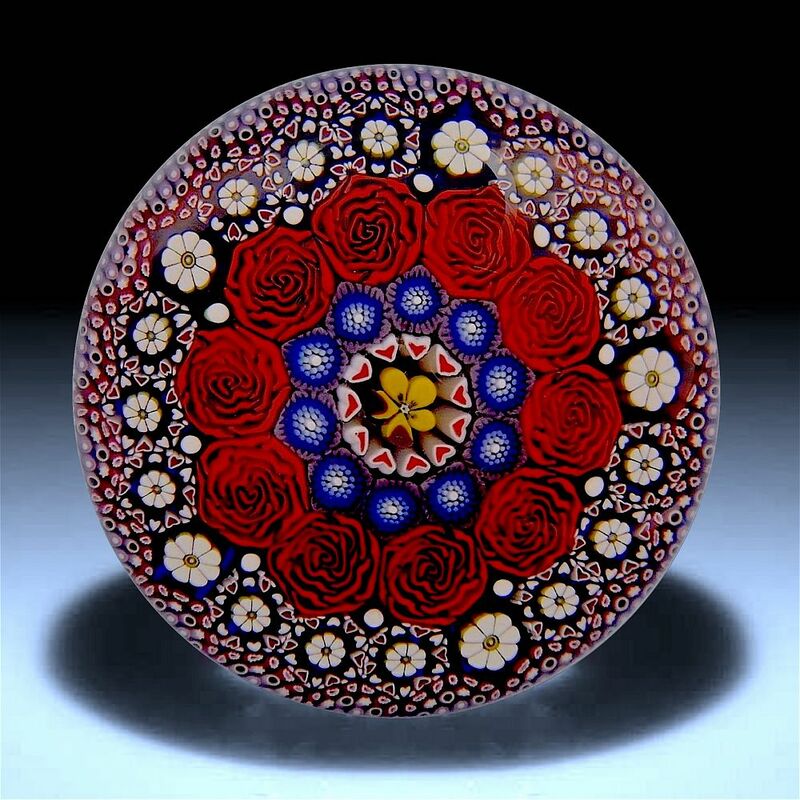 This gorgeous paperweight was made by Michael Hunter for Twists Glass in 2015. Made of complex murrine canes it has a yellow & purple pansy cane in the centre surrounded by small red heart accentuating canes around which are 10 purple blue & white canes. These canes are surrounded by 10 large red rose canes which have small white accenting canes between them and the next ring of 20 canes comprising 15 canes with small white daisy centres & red & white heart outers & 5 larger white daisy canes ( alternating3 daisy centre, 1 daisy) which in turn are surrounded by the final & outer ring of 20 red & purple canes with small white accentuating canes between them and the outer casing. The two outer rings give the impression of a daisy field. The base is scratch signed "M Hunter Twist 15 1 of 1" with Mike's personal "MH" silhouette cane in the centre and a Twists Glass studio label.